7 Three core strategies I. II. III III. 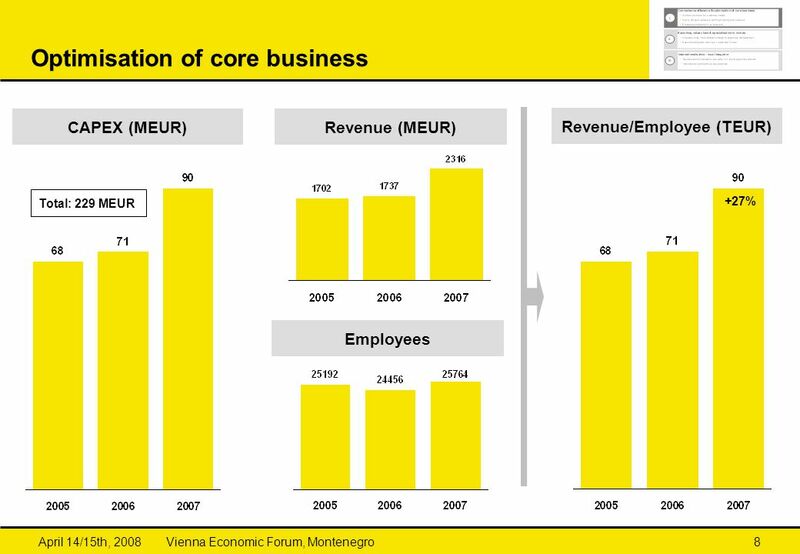 :33 Optimisation of core business CAPEX (MEUR) Revenue (MEUR) Revenue/Employee (TEUR) Total: 229 MEUR +27% Employees Latest acquisitions considerably strengthened the Parcel & Logistics Division, and now contribute more than 30% of total Group revenue. Mail Division developed very well. The new acquisition Scanpoint has been well integrated into service portfolio, meiller direct complements the value added chain. Parcel & Logistics Division grew organically, also due to the acquisition of TOF. Slight decline in the Branch Network Division. 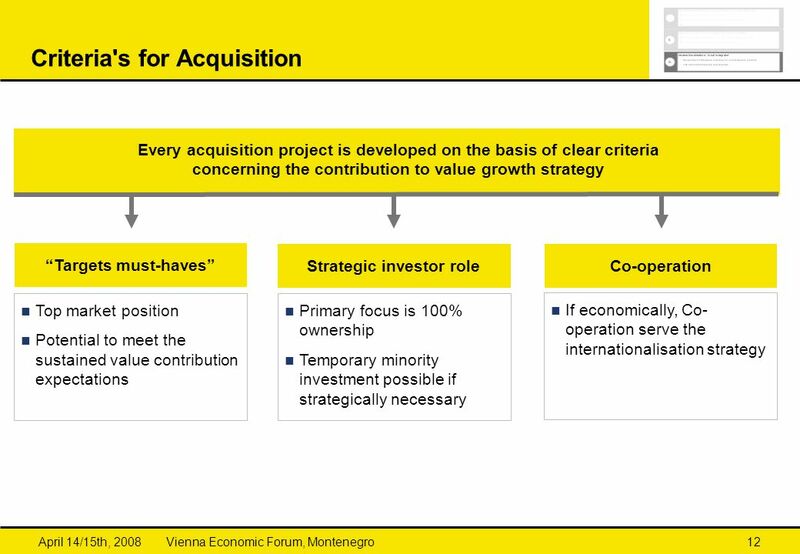 :33 Criteria's for Acquisition Every acquisition project is developed on the basis of clear criteria concerning the contribution to value growth strategy “Targets must-haves” Strategic investor role Co-operation Top market position Potential to meet the sustained value contribution expectations Primary focus is 100% ownership Temporary minority investment possible if strategically necessary If economically, Co-operation serve the internationalisation strategy Latest acquisitions considerably strengthened the Parcel & Logistics Division, and now contribute more than 30% of total Group revenue. Mail Division developed very well. The new acquisition Scanpoint has been well integrated into service portfolio, meiller direct complements the value added chain. Parcel & Logistics Division grew organically, also due to the acquisition of TOF. Slight decline in the Branch Network Division. 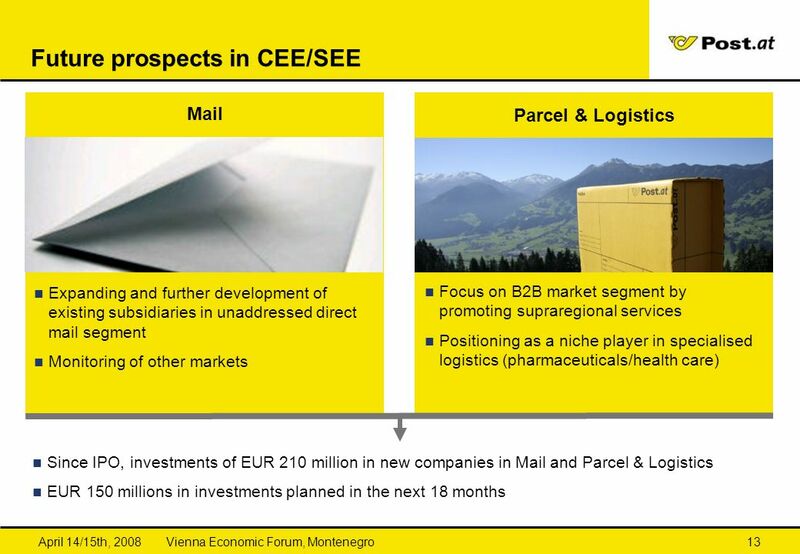 :33 ANHANG: MÖGLICHE FOLIEN FÜR DEN EINSTIEG Latest acquisitions considerably strengthened the Parcel & Logistics Division, and now contribute more than 30% of total Group revenue. Mail Division developed very well. The new acquisition Scanpoint has been well integrated into service portfolio, meiller direct complements the value added chain. 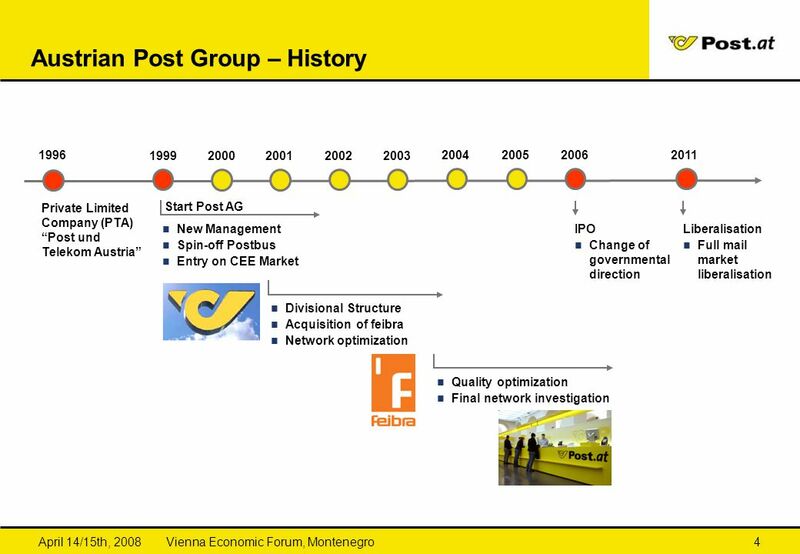 Parcel & Logistics Division grew organically, also due to the acquisition of TOF. Slight decline in the Branch Network Division. 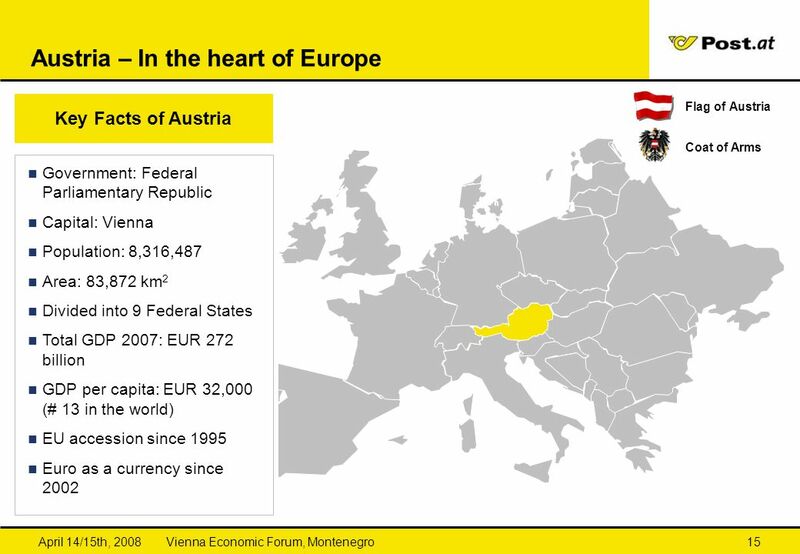 :33 Austria – In the heart of Europe Key Facts of Austria Flag of Austria Coat of Arms Government: Federal Parliamentary Republic Capital: Vienna Population: 8,316,487 Area: 83,872 km2 Divided into 9 Federal States Total GDP 2007: EUR 272 billion GDP per capita: EUR 32,000 (# 13 in the world) EU accession since 1995 Euro as a currency since 2002 Latest acquisitions considerably strengthened the Parcel & Logistics Division, and now contribute more than 30% of total Group revenue. Mail Division developed very well. The new acquisition Scanpoint has been well integrated into service portfolio, meiller direct complements the value added chain. 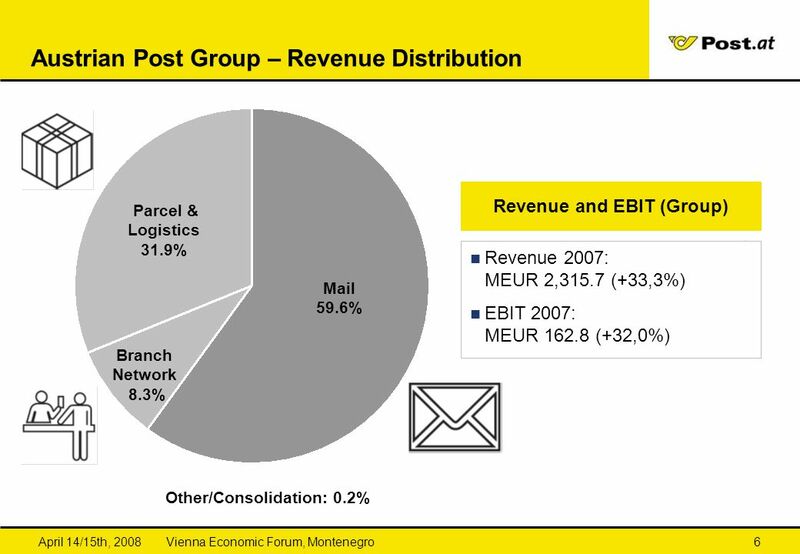 Parcel & Logistics Division grew organically, also due to the acquisition of TOF. Slight decline in the Branch Network Division. :33 Austria – Some impressions Impressions of Austria 1 2 1 Austrian Parliament, Vienna Stephansdom, Vienna Schönbrunn/Gloriette, Vienna Neusiedlersee, Burgenland Großglockner, 3,798 m Golden Roof, Innsbruck 2 3 4 3 5 6 6 5 4 Latest acquisitions considerably strengthened the Parcel & Logistics Division, and now contribute more than 30% of total Group revenue. Mail Division developed very well. 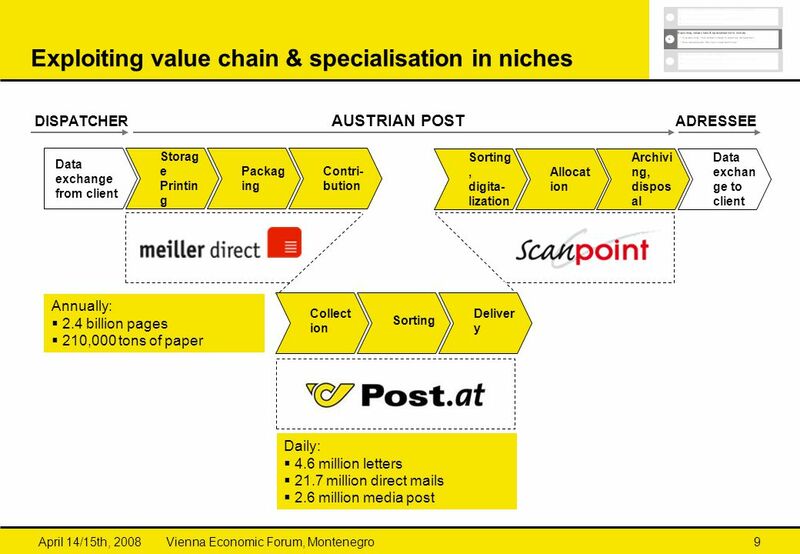 The new acquisition Scanpoint has been well integrated into service portfolio, meiller direct complements the value added chain. 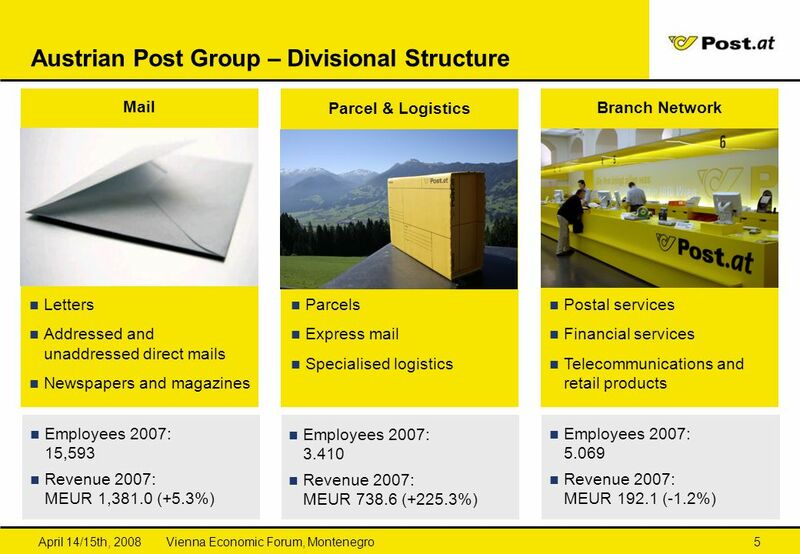 Parcel & Logistics Division grew organically, also due to the acquisition of TOF. Slight decline in the Branch Network Division. 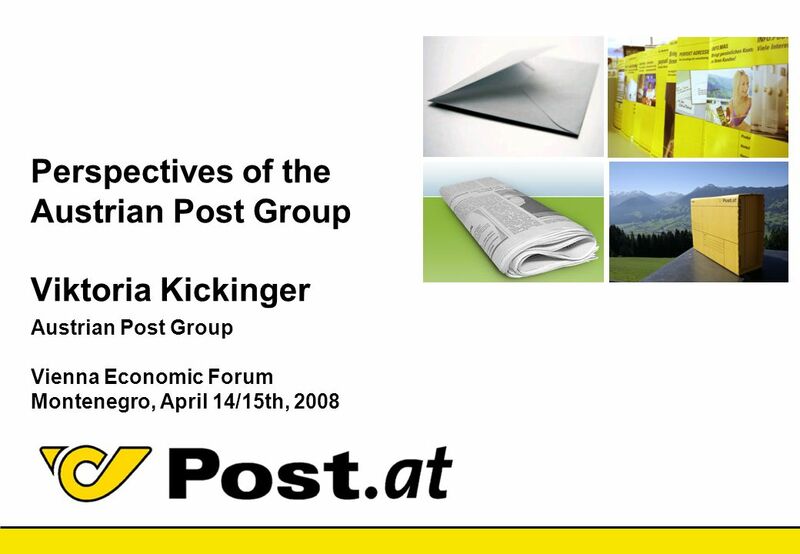 Download ppt "10.04.2017 21:33 Perspectives of the Austrian Post Group Viktoria Kickinger Austrian Post Group Vienna Economic Forum Montenegro, April 14/15th,"
Developments of Communications for the Austrian and CEE Corporate Bond Market. 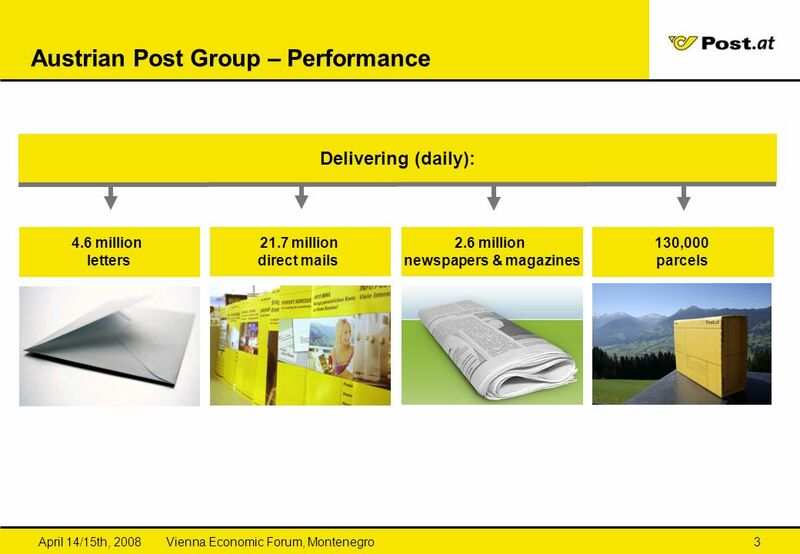 1 World Mail & Express Americas 2010 | 23 rd February 2010 | C.-G. Mende | Austrian Post Key Figures Austrian Post Revenues: EUR 1,723.2m Employees: ca. Kishor Tailor Chief Executive Humber LEP. Humber LEP Area. 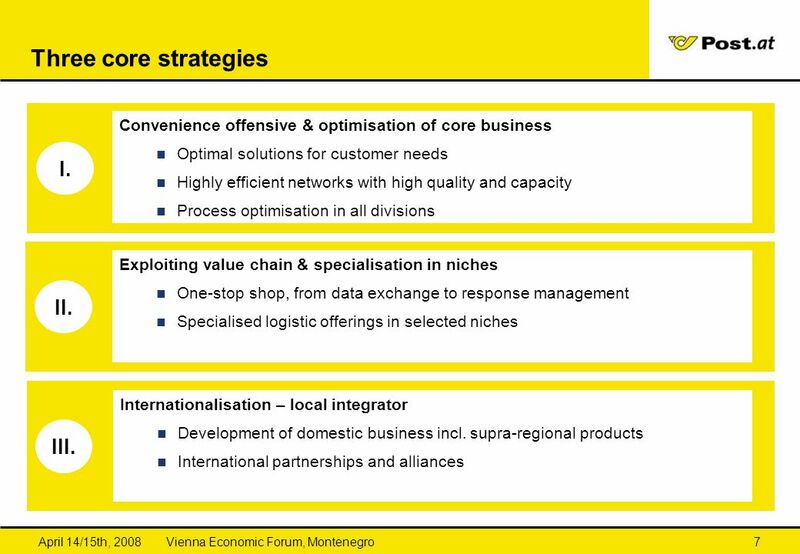 Team BethoveenMGT 693 Spring Agenda Value Chain Industry Analysis Airborne Strategy Recommendations Current Situation Update. „Macroeconomic Context and New Strategy of Competitiveness“ Kemal Kozarić, Ph.D. Governor of the Central Bank of Bosnia and Herzegovina The 2012 SEE Management. „Current Issues and Future Challenges and Perspectives of Economy of Bosnia and Herzegovina“ Kemal Kozarić, Ph.D. Governor of the Central Bank of Bosnia. 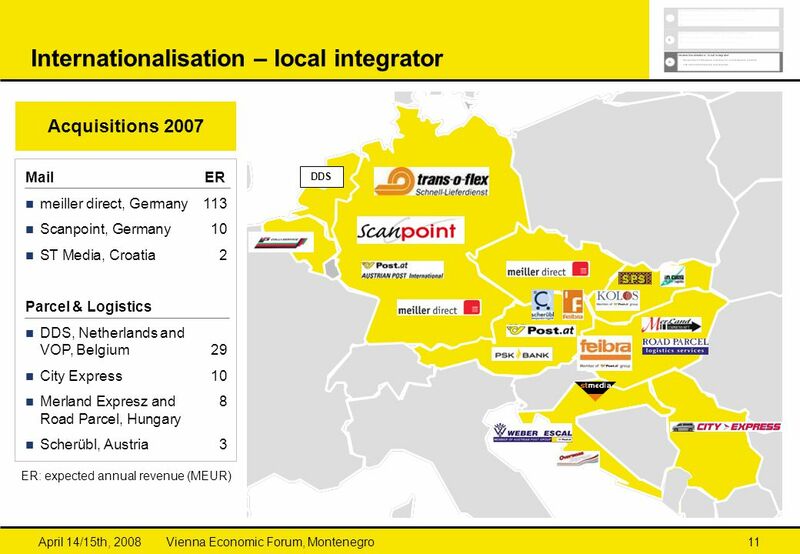 Dusan Kulka, FDI Advisor Regional competitiveness Forum, November, 2006 (Foreign Direct) Investment (Regional) Competitiveness. 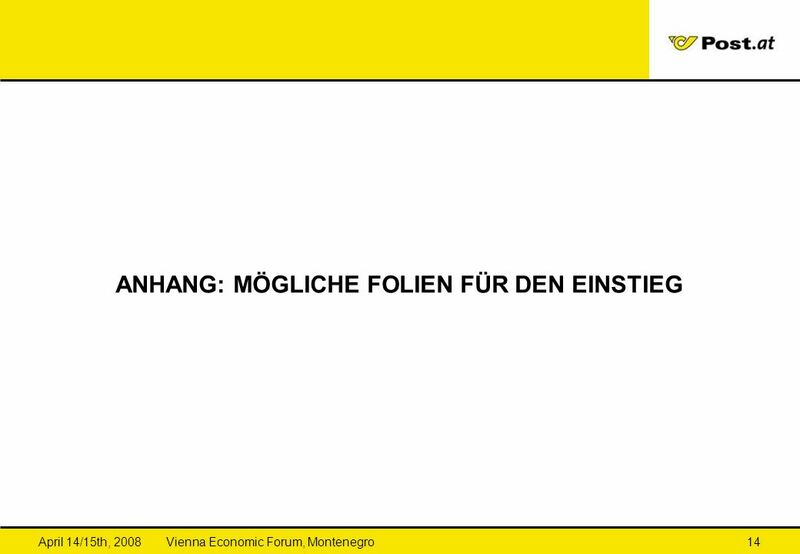 Industrial and Innovation Policy in Austria By Daniel Föger Hong Hai Luong. Competitiveness of Polish Economy Perspectives for Euro Adoption Magdalena Zając. 1 Hungary - Gateway to Europe Sándor Holbok President Hungarian-Mongolian Committee of the HCCI Business Forum – Ulaanbaatar 5 September 2014. 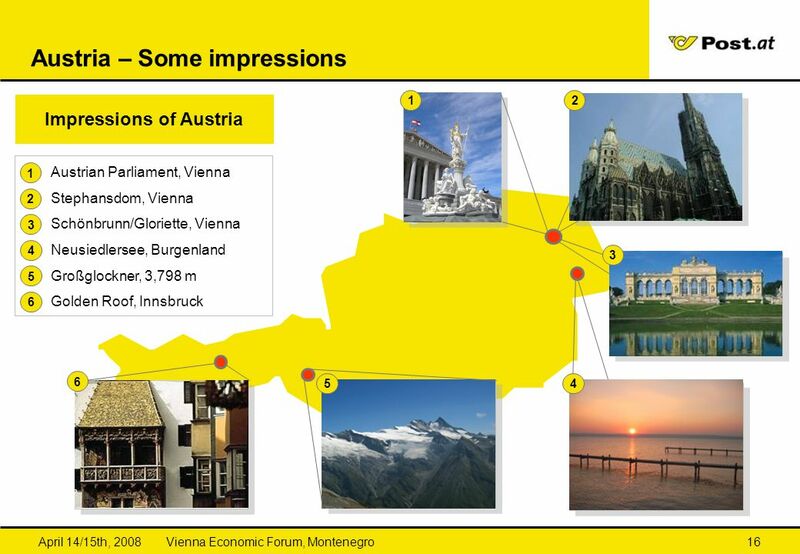 The Profitability of Austrian Foreign Direct Investment: Reinvestment or Repatriation? 4th FIW Workshop: „Foreign Direct Investment- Determinants and Home. European Commission 1 -1- Introduction to the Community Programme for Employment and Social Solidarity PROGRESS 2007-2013.